Lost Voice Guy’s 2014 solo show, Laughter Is The Worst Medicine was filmed live at the Edinburgh Fringe Festival. 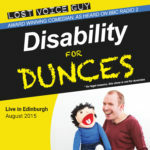 When Lost Voice Guy was rushed to hospital during this first ever Edinburgh Fringe, he nearly died. In fact, he became as silent as the ‘P’ in pneumonia and ended up with 99 more realistic problems than Jay Z. Stuck in bed and miles from home, he began to wonder if laughter really was the best medicine after all. Then he had morphine and he realised it wasn’t. Jesus may walk on water, but Lost Voice Guy runs on batteries. 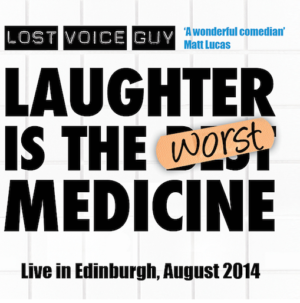 And he recharged and rose again to tell the tale in this new show. English subtitles available on DVD version.